You can't change your job in Oman to a different employer unless you get a No Objection Certificate (NOC). The problem is, if your employer gives you a NOC, the Ministry of Manpower will then not allow your current employer to get a new clearance to replace you with another expatriate employee. Basically, find an Omani to do your job, and then your employer might give you a NOC. 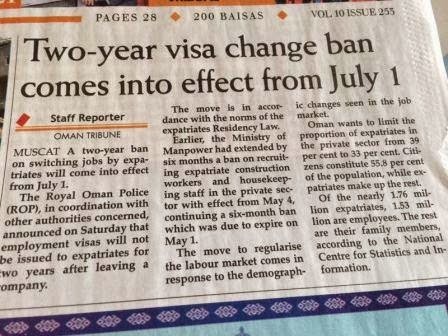 The only other way to change your job (to a different employer) is to leave Oman for 2 years, and then return. There are some companies out there that have given NOC's. There are a lot more that wont. I can even think of one particular situation where a company agreed to give someone a NOC, they changed jobs, and then they refused to give that person a NOC, creating all sorts of drama for them. Now, I totally get why this rule was brought in. It costs a lot to bring an expatriate worker to the country and set them up with visa's etc and the rest. So you could imagine an employers frustration when after 6 months, an employee would hand in their notice and switch to a competing company for presumably an increase in pay or better working conditions. The problem with this rule is really quite simple: It doesn't consider those of us who have fulfilled our contractual requirements. Take me for example - I've been here 8 years, I worked for 4 years with one company, and then moved to a competing company. The move was good for me, I got a payrise, increase in leave allowance and career-wise, I got to work on some pretty great projects. Let's say that now after 4 years with that company, I've gained more experience and expertise and want to look for a new job. Not the same job, a new position, higher up the ladder. I have no choice but to look for opportunities outside of Oman, and take my 8 years of local market experience with me. My employer would be nuts to give me a NOC - they're under no obligation to, and why would they then shoot themselves in the foot because they wouldn't be able to get a clearance to replace me with another expat. Now, is this 2 year visa ban rule really in the best interest's of the country and its economy? Obviously I'm bias and I don't think it is. I've fulfilled my 2 year contractual requirements with my employer, and am now on an understanding of just giving 2 months notice and I can leave, or they can let me go. I'm not saying I currently want to change jobs, I'm just saying that in my particular circumstance, as an experienced expat employee in what I do, I've got no option but to look for future work outside of Oman, and to take my experience with me. This ruling makes me choose to stay in Oman in a job that I might not want to do for ever, or might not like should my employer change my working conditions - or to leave Oman to go and work somewhere else. Wasn't the point of this ruling to make expats honour their contractual commitments with their employers - or was it to make us unable to develop personally in our own careers in the local market? It might be that this is an intended effect of this ruling, to bring down expats in general living and working in Oman, but given that Omanisation is no where near where I think Oman would like it to be, perhaps this is a little bit premature? This rule, in it's current form virtually guarantees an expat labour brain drain from Oman over time. In fact, for those expats who stay in the same job (unless they are a GM or similar, and already at the top) for years and years - they will stagnate over time, it's just inevitable - and still they won't be the best assets for helping Oman develop. The question that needs to be asked is: Is this good for the economy of Oman? Am seriously pleased the way with you pen down the thoughts, the feelings that run through minds of several readers - be it expat or Omani. I always keenly look forward and predictably so - your blogs to come up on topics as this one. I am all for Omanisation and putting national objective at forefront; but perplexed with the approach. Not sure how this would get translated into real benefits. Just wait and watch. Employers can't use "we'll lose a clearance" as an excuse for not providing a NOC to enable a departing expatriate to join another company in Oman. If the proper procedures of exit / visa cancellation are followed, the previous employer does remain eligible to seek a 'replacement' clearance, and of course often does so. The NOC the first employer gives is used by the employee / new employer only post-exit, when the new employer seeks a visa with which to bring the departed expatriate back top Oman, and doesn't get in the way of any 'replacement' clearance applications. There used to be a procedure referred to as a 'local release' which enabled an expatriate to move from one employer's visa to another's without exiting the country. In such cases the employer granting a 'local release' doesn't become eligible for a 'replacement' clearance. Not surprisingly, 'local releases' have become rare - my guess is they're now used only when a dependent gets a job and needs to switch from a dependent's visa to his or her own work visa. Employers who decline an NOC do so only because they want to discourage job-hopping; they don't want to be forced to match the higher compensation the competition is often offering. Keeping their costs down was, of course, the entire reason for employer's lobbying the authorities for the two-year-rule. Omanization has nothing to do with it. @ Desert Leopard - Can you shed the difference between NOC and local release. I am seriously confused on their purpose and interpretation. Local release only works when you are changing jobs for the exact same description. EG your visa says you are a lorry driver, and your new job will be a lorry driver, and your new employer has a labour clearance for a lorry driver. It doesn't work when you are changing your job (or at least your visa job description). Desert Leopard, I agree with what you said. Sythe, I personally got a local release before this law and the job description wasn't matching, the former job was (***** Engineer) and the new one was (***** manager), the new sponsor only had a clearance for a director, which worked fine. I needed an NOC from the previous employer though. Back to Desert Leopard comment; this is what I understood from different experts, everyone needed NOC even before June 2014 in order to change jobs, take my case for example, before the new law you could do it locally without having to exit the country, and the old employer won't lose their clearance. With the new law, you still need the same NOC in order to change jobs, but if you don't cancel your visa and exit properly then your old employer will lose their clearance. Hence, explain to your employer the process because most of them don't understand it, then request NOC, then cancel your visa and leave Oman. At this point your old employer can get new clearance, and the new employer should start working on your new work visa, which is a complete new residency application. To put this in perspective; Your new resident card will have a new number, as opposed to the case of local release when you change sponsors, you notice that you keep the same ID number. Now, if you try to leave your job, without NOC, in this case you will be banned from working in Oman again for 2 years. I am not saying this is the reality 100%, or you should take my words as a proper interpretation for the law, but this is how I understood it from different experts, at the end before you proceed with any of these things, make sure that both PROs of the old and new employers are on the same page and understand what they are doing. You are all trying to use logic and common sense to rationalise not having the above procedures in place. Remember: you are dealing with, as one other blogger put it earlier, "A Carnival Of Idiots". Speaking of high-quality staff….Google any one of the fake degree universities from the latest Axact scandal along with "Oman" and it is very interesting to see the names that some up.